There’s plenty to be excited about when it comes to Warframe’s upcoming Fortuna expansion, which is adding a new hub city, a new open world zone on Venus, and a whole new story to explore. But one of the flashiest additions is the Bondi K-drive, the blisteringly-fast hoverboard that will let you zoom around Venus like the space ninja version of Tony Hawk. Digital Extremes has shown off some footage of the K-drive already, but we got another peek at it Friday during the studio’s regular developer stream on Twitch. The team pulled up a video showing a Tenno launching off a huge ramp, only to land on an above-ground pipeline and continue traveling in a forward grind. There are also some landscape features in the Venus open zone that function as rails in a skatepark, so players will be able to test out their tricks as they traverse the world on the K-drive. What Digital Extremes showed on Friday was still work-in-progress footage, and things like sound effects and trick characteristics still have to be finalized. 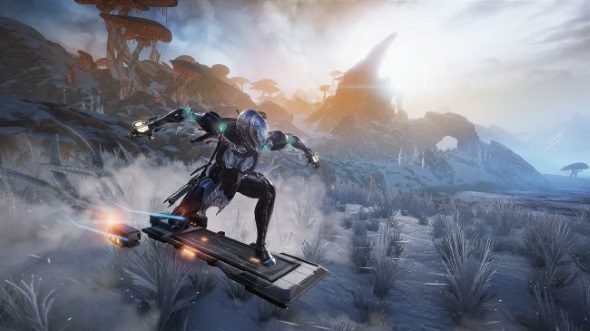 However, when Fortuna ships, players will be able to customize their boards’ appearance and change the way they behave with a full new set of mods, the way they do with their warframes and weapons. Since @sj_sinclair is sharing so many in progress stuff. You can watch the full archived stream here. What we know about the Warframe Fortuna release date is that it’s currently set for some time this fall. It’ll be free to play, just like the rest of Warframe.